If traditional braces or clear aligners aren't right for you, 'translucent' ceramic braces are another great low profile orthodontic treatment option. But keep in mind that there are a few important factors to consider before you choose this option. How are ceramic braces different from regular braces? Are they really translucent? Metal braces are constructed completely of metal, whereas ceramic braces have brackets that are made of a tooth-coloured ceramic instead. So while the ceramic brackets aren’t ‘translucent’ in the literal sense, the effect is one of transparency since they are so similar in colour to your teeth. The overall look is much cleaner and more streamlined. Are there any downsides to this to this style of braces? Ceramic braces straighten your teeth the same way traditional braces do, but there is one important difference. This is that the ceramic material is not as strong as metal is. Your orthodontist won’t be able to apply as much force during each adjustment session as he would with traditional braces, so your treatment may take longer than it would with metal braces. Ceramic braces are also cost more than traditional metal braces. To minimize costs, some patients choose to only have the ceramic brackets applied to their most visible teeth, and use metal brackets for the ones in the back. Finally, though ceramic brackets are actually bigger than metal brackets are. The difference is hardly noticeable, especially because their colour lets them blend in with your teeth, but worth keeping in mind nonetheless. 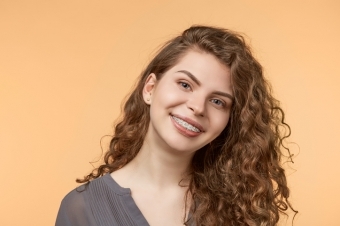 If you think translucent braces may be a good choice for you, one of our BC Orthodontics Practices today for a consultation. Ready to set off on the path to a beautiful new smile? Contact us today.